If you have ever owned a dog, you know the strength of the stink-bombs that a pooch with a digestion problem is capable of delivering. Now, since most indigestion cases in pets arise when the dogs eat their meals really, really fast so they donât have to struggle with a slippery dish, the solution lies in stabilizing the dish on the floor. 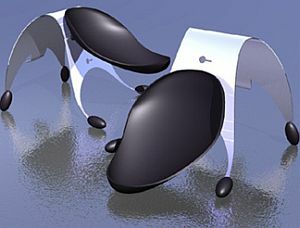 Which is where this Ergonomic Dog Dish created by Fred Reber does a bang up job. With a framed aluminum stand and ABS plastic dish, the dog bowl stands firm on the ground even when the most anxious pet uses it for dinner. The sturdy base allows the pet to relax and eat normally without skidding the dish or tipping it over while copolymer feet prevent floor damage. The best part is that the dish can be lowered or raised to suit your dogâs height which, of course, is always good for its digestion which in turn is good for the ambiance of your house! Double Bike – Creativity or attention problem? Calendar Clock, with no tick-tock!